My first real photography class started with an old Pentax and a desire for expanding my creativity beyond a well crafted thesis about tones and metaphors. It didn’t take long for my inspiration to wander off toward my growing bookshelf. I made this image using Norton’s Anthology to English Literature (Vol. II), a jar of chocolate frosting, and black food coloring. Inspiration? Umberto Eco’s Name of the Rose. In the novel, the main antagonist poisons victims of his Abbey by blotting the page turning edges of “toxic” Literature with poison. Moral of the story? 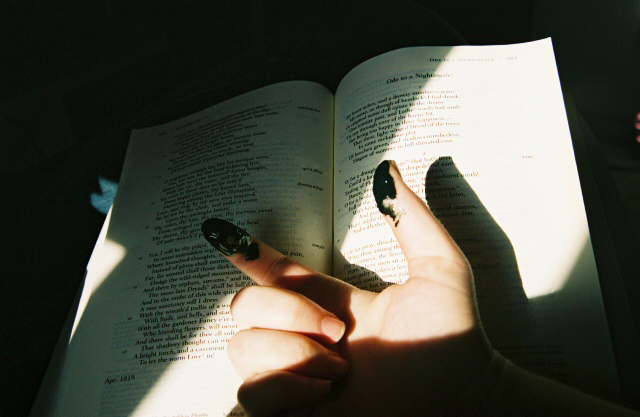 If you want to read in the restricted section, don’t lick your fingers.